The L-T Experience: How To: Pocketpede! I know of a certain little boy named Logan who loves to collect tiny treasures. He loves to hide his green marker, dad's old wallet (complete with old library - um - I mean "credit" card), various pens that he pinched from our stash, several receipts that he needs to look over when he's "shopping" etc. And where best to hide all these terrific toddler finds? In his very own Pocketpede hanging wall pockets! 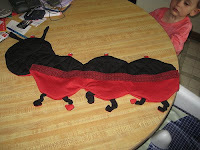 You can basically make this Centipede any size you wish and add as many body sections as you want. Therefore, I haven't set up a template (besides I have no idea how to do that whole PDF pattern thing - I'm such a noob). The best thing to do is find the place in your child's room where you want to hang the Pocketpede and get a good measurement so that you don't make it too small. It's easier to work with the bigger it is. Next, find something circular to use as your body sections stencil. I used my 8" embroidery hoop for this. Lay out your double sided quilted fabric in a single layer. Then I traced my embroidery hoop onto the fabric - making 3 overlapping body sections. Then I overlapped the head piece and set it a little higher than the rest. Cut this trace out. I said to put the quilted fabric in one layer because most of it comes with one colour on the back and another on the front (in my case, black and red). If you want the back of your Pocketpede to be a different colour, then you need to cut the two pieces out separately. Do this now. To cut out the netting for the pockets, all you need to do is find the halfway mark on your quilted body section and cut the pockets from halfway to the bottom using the same body curves. To cut out a pocket band, use your coordinating fabric and cut a band 3 inches by however long your body section is minus the head. For example, mine body section ended up being 22 inches long, so I cut the band to be 3 inches by 22 inches long. To cut the Centipede feet, use either your coordinating fabric, or the scraps from your quilted fabric (I used the quilted). The easiest way to do this is to cut 2 feet per body circle - so 6 in my case. Cut 6 - 2"by2" squares. Fold the squares in half diagonally and cut them along this diagonal. It will give you 12 triangles which we will sew into feet. 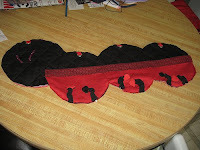 To cut the legs and antennae, use the coordinating fabric - or in my case, I used some scrap ribbing I had to make extra scrunchy legs. Cut 8, 3"by2" rectangles. Wow! That's a lot of prep work! Now let's start putting it all together! Take your pocket band that you cut out of coordinating fabric. 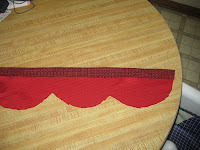 With the right side of the fabric pinned to the upper wrong side of the pocket netting, stitch. Fold the fabric to the right side of the netting, and press under 1 cm to form a band. Stitch. 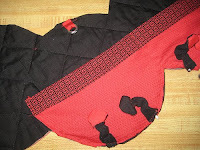 Place the wrong side of the pocket piece onto the right side of one of your quilted body pieces. Pin in place. Stitch 2 lines. One from top of pocket down to the place where the first body circles join and another from the top of pocket down the where the 2nd body circles join (forming the dividing lines between the pockets). Turn pieces right side out. Fold 1 leg/antennae piece in half, right sides together and stitch along raw edge. 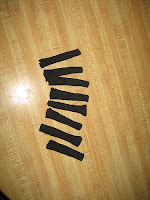 Cut 6 - 2 inch pieces of elastic. Insert the pieces through the leg tubes you have just made. Pin in place. The legs should be a little longer than the elastic, so that when you put them together, the leg fabric will scrunch up a bit. This is really fussy kind of work and I found it a little frustrating actually. 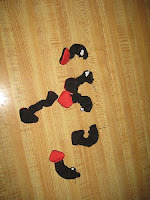 Pin the bottom of leg, with the elastic into a foot and hand sew together. Repeat for all legs and feet. Remember to keep the pin in place at the top of the foot so that you don't lose the short elastic inside the tube. This part is tricky. A tiny safety pin might work better? 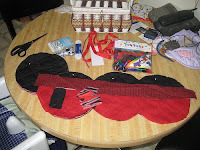 Pin the legs onto your body section (as in picture) and baste pocket and legs onto the body section. 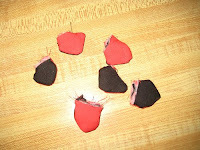 Depending on how you placed you pockets - you might have to do a tiny hem on the side near the head. As in the picture, my pockets came up higher than the beginning of the head, so I needed to hem that side to finish it nicely. 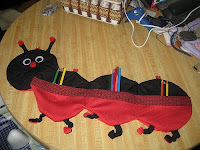 Cut one length of pipe cleaner in half and insert the pieces into the remaining tubes for the antennae. Pin onto the head piece wherever you want to put the antennae. You can leave the pipe cleaner sticking out of both ends for now. Cut 4 - 2 inch pieces of your bias tape. Place a plastic ring on each and fold the tape in half to hold in place. Pin bias tape to the uppermost part of every circle in the body section and the head. Baste all of these in place. Take the remaining body/head section piece and pin it, right sides together, to the piece we've been working on. 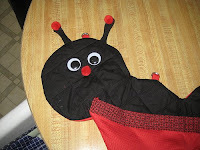 Stitch all the way around the body and head, making sure not to catch any of the feet or antennae into your seam. Leave an opening at the back so that you can turn the whole thing right side out. Turn the body right side out being sure to poke the circles and head out carefully in order to make them round. Press it all into the form you want it. Add googlie eyes to your pocketpede. Go nuts! Decorate it however you like! Viola! Done! Now go hang it on your wall! And if all of this sounds too complicated to you - you can always go on over to the Tawny Bee Etsy shop and purchase one! If you do decide to try out this tutorial, I'd love to see the results. I have set up a Tawny Bee Flickr group for just such an occasion. Feel free to join and put pictures of your Pocketpede up there or link it in the comments below!